Some weeks ago I spotted a black spot under my toenail. First I though it might be a mole, as I am prone to getting new very often. Today I was taking my socks off and noticed that a second one appeared almost next to it. Both spots seem quite symmetric, and I do not have any type of discomfort. Could this be some type of nail infection? Sitting on the other side of the internet, I cannot pretend to know exactly what those black spots under your toe nail actually are, but I will give you some insight and what you can do about them. The majority of spots that occur underneath a nail are harmless. In most cases it is dry blood usually from some sort of trauma to the nail bed. The trauma does not have to be as severe as dropping something on your toe or someone stepping on it. In many instances it is from repetitive micro trauma such as wearing a shoe with a narrow toe box thus creating too much pressure on the nail and it starts to bleed underneath. If you happen to be athletic, that too can create this type of micro trauma. In many instances it can be mild bleeding from an irregularity on the nail bed, again usually from nail irritation. Another very common cause of discoloration underneath a toe nail can be from fungus. I enlarged your pictures as best I could and it appears that the nail surrounding the two dark spots is discolored, which certainly may be fungus. in most cases from a mole to a granuloma (which is scar tissue from irritation), all the way up to a skin cancer. So now we know it could be any number of possible conditions, again most of them harmless, but keeping in the back of our mind that there is possibility of a more serious problem. Here is my recommendation. Do nothing right away. 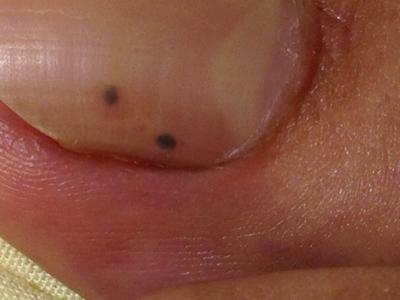 Mark where the discoloration is today, relative to the skin on the side of the nail. Wait two months and see if the discoloration, both of them, grow forward, leaving no residual discoloration in the original spots. The reason I recommend this is because the majority of harmless discolorations under a nail will grow forward as the nail grows. Eventually the discolorations will be at the end of the nail where it can then be cut away. That's the end of that. Now, if the discoloration does not grow forward, there is a very good chance that there is a growth on the nail bed. Again, most of these are not serious problems, but at that point I would recommend seeing a doctor to have the nail removed to see what kind of growth may be on the nail bed. If the growth is suspicious it may have to be removed and biopsied. Although not common, skin cancers particularly melanoma can occur underneath a nail and this needs to be ruled out. If during this two month period the discoloration appears to be getting larger, even if it may appear to be growing forward, that too would be a warning sign that there may be some sort of growth on the nail bed and it should be investigated. Actually I didn't see a doctor. But after 6 months I noticed that it's also moving upward and thank god I already cut them off since it grows fastly. i went to doctor and doctor inform that the discolouration might be caused by fungal infection. after 3 months i notice the dots move upward together. thus, it was blood clot caused by tight shoes or running activities. im relieved now. i had cut my nails and no more black dots. Ive read through all of these comments and somewhat relate to most of them but im not sure if my case is different or not so here i am. I have a small cluster of 5 black dots on my big toe, almost exactly like the picture but they're all the size of a pin head. Is this any different from the others? Im going to see my doctor next weekend just to check on these. I have this black spot on my nails. And both of my toe nails have it in the same position. Please help me to find out what this is. I cannot help you without actually looking at your nails, so your next best option is to see a local podiatrist and put your worries to rest. I have very tiny black dot under the toenail too. However, smaller than the picture above. is like a pen dot. but there are 4. I just realized after scrapping dead skin near by the spot. I am very worried and cant sleep after finding out one of the possible cause would be melanoma. Can running cause such small tiny spot? does it indicate serious problem and seek medical attention immediately? Running can certainly cause damage to a nail including discoloration. Since you are concerned, seeing a doctor should relieve your fears. Hi there. I am concerned because I have had a small (pin point) black dot under my thumbnail, as it grew out and reached the tip I noticed another small dot where the original one had been. Now that the second dot has reached the tip Ive noticed a third (this one larger) dot in the same spot. There had been no trauma to the nail. Please, what could this be? I removed nail polish from my toes in Dec and noticed a Black spot the size of an eraser on the right toe near the cuticle corner. After a month I went to a podiatrist and he measured it and said come back in 3 mo. Does that make sense to wait that long? It doesn’t look like it’s moved or changed color. I’ve been reading about black spot and now starting to worry it’s cancer. Should I see a dermatologist for a second opinion, what should I do or wait my 3 mo.? The reason you wait is to see if the discoloration grows forward. If it does then it is nothing more then a discoloration in the nail. If it stays in place then the nail needs to be removed and the discoloration needs to be inspected and tested. In the vast majority of cases, nail discoloration is a benign situation. However, if you are sitting around worrying about the possibilities, you could always return to the podiatrist and ask him to remove the nail for peace of mind. In my opinion, I think podiatrists remove more nails then dermatologists so that is the reason I would suggest going back to the podiatrist. Getting a second opinion in cases like this is not much help, simply because the only way you could know if this was a melanoma would be through a nail biopsy, meaning the nail would have to be removed. Hi...just now i noticed i have this dark small spot in my toe nail..very similar to that photo but mine is one spot only..
Im so nervous that it might be something serious. Especially im pregnant...Can you please help me understand this? Relax, the vast majority of nail discolorations are harmless, however, the prudent move would be to have a podiatrist or dermatologist take a look at it. If nothing else, it will give you peace of mind. How can I submit a question and photo? Most nail discolorations are either from fungus or from bleeding underneath the nail and are harmless. At your leisure go see a podiatrist or a dermatologist and have them checked out. Do not waste your time in the ER. I have a small black dot under my nail on big toe looks like picture on this site. I also have a tremendous amount of pain on the whole outside of that same foot. Any ideas what that could be? I noticed a few years ago the same black spots under my big toe nail. I know it sounds crazy but I stick a pin into it, after a few seconds I took the pin out and the spot shot across my nail out of sight! Not sure if related but I do wonder as I get terrible pain in my joints. Just as one joint eases, another flares up. Could this be the little black horror passing around my body causing pain and discomfort? I've had blood tests done but nothing has ever shown up.. Just as the pain from my right knee subsided, I'm now in agony with my left shoulder (I struggle lifting my head up and down). Not sure what to do??? Almost 3 weeks ago I wore shoes that squished my toes together. As a teacher I worked in them the whole day. A day later I noticed a black spot in the left corner of the nail, around where my toes were squished together. Now the spot seems to be growing. Should I be concerned? My guess is it is just some bleeding under the nail and should grow forward. If it does not grow forward, or continues to get larger then I would recommend having a doctor look at it. I have had a black line going diagonally across a middle toe in my left foot. I have kept an eye on it for about a year. For almost that entire time it remained stationary. About a month ago it appeared to have moved towards the top of the nail. I thought it was growing out. Then last night I took off my nail polish and noticed there is now a new, much larger black spot (the older one is a line) on the bottom of the toenail. Should I be concerned? The nail Is healthy sans the black spot and line and there is no discomfort of any kind. An enclosed picture would have been helpful, but the smart move here would be to have a podiatrist or a dermatologist take a look at it. In most cases it is nothing, BUT, you never know. Go have it looked at by a doctor. Hello I had a question about this same thing. I have two spots in the center of my toe nail (bigger than the one in the picture on this page) and just recently I noted overnight it seems to now have discolored the majority of the right side of my toenail. I've had the spots for a couple months but recently I've experienced more pain in the nail especially because I've been paying more attention to it. If I upload a picture here could you possibly lend a hand and let me know if this is serious or not. Im really concerned. The better move would be to see a local podiatrist or dermatologist as pictures can be deceiving. Additionally, in my practice, I sometimes have to actually cut away a piece of the nail to see what is going on underneath. My sister yesterday take out her sock and show me her two feet will black dot quite same without hurt or conflict. We quite nervous when think about heart desease or skin cancer. We will keep eyes on it for some weeks. Let's look. Now it is middle of winter, hope that it result from wearing shoses. Hi! It did turn out the be a couple of small bruises under the toe nail, probably cause by some new running shoes I got. After a couple of months they grew out and I had no further issues. Did you ever find out any more? I have 4 or 5 of these on the sole of my foot, but recently got into running so I wonder if that's the cause. What did you ever find out about your black dot? I have had one under my toenail for about 1-2 months. It it something to worry about????? I have had some tenderness and pain with it as well.